At Google Fiber, we are passionate about superfast Internet. We believe that people shouldn’t wait to connect to the things they care about—like that awesome YouTube video, can’t-miss TV series or those photos from the last family vacation. But as we've rolled out Google Fiber in Kansas City, Provo and Austin, we’ve learned that Fiber has been impacting our subscribers in ways that we didn’t expect. Loading bars used to give people an opportunity to pause and take care of the little things—like making a cup of coffee, taking a bathroom break or playing with the dog. We’ve been told that Fiber’s seemingly instant connections have taken away that precious time. This got us thinking—what if we could help people get their time back even while they used Fiber? We worked with dial-up engineers, 56k researchers and T1 enthusiasts across the world to build our newest feature: dial-up mode. It wasn’t easy, but we got to the root of the problem. By incorporating dial-up technology, we were able to reduce Fiber speeds up to 376 times by withholding photons from the fiber strands. In doing so, the light-based fiber optic technology dims to a flicker of its previous capacity, giving our users those precious moments to load the dishwasher, hug the kids or walk the dog. To activate this new feature, simply click the menu at the top right-hand corner of your browser and select 'Dial-up Mode'. Then sit back, relax and enjoy the power of slowness. Over the coming weeks, we'll be rolling out dial-up mode to gigabit customers in Kansas City, Provo, and Austin, helping meet the need for slow. 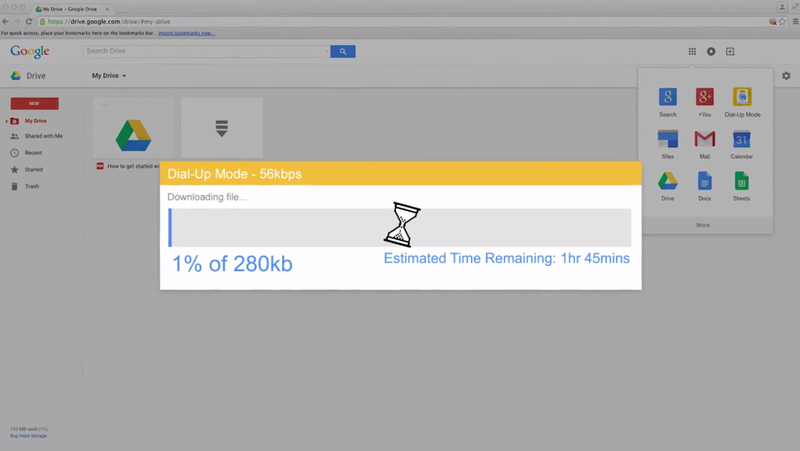 We hope to bring this feature to all Google Fiber subscribers soon.